SUMMARY: Based on a true story, an Indigenous girls band from Australia earns the opportunity to travel to Vietnam to entertain the American troops during the war. DETAILS: The Sapphires is That Thing You Do meets soul music and the Vietnam War. A group of Indigenous singers in Australia catch the attention of a makeshift music promoter (Chris O’Dowd) who helps them transition from country to soul music and take their show to Vietnam. Loosely based on a true story, their new manager secures an audition in Melbourne that will change their lives. The girl singers (Deborah Mailman, Jessica Mauboy, Shari Sebbens, and Miranda Tapsell) change their name to The Sapphires, and head to war-torn Vietnam to entertain the American servicemen. 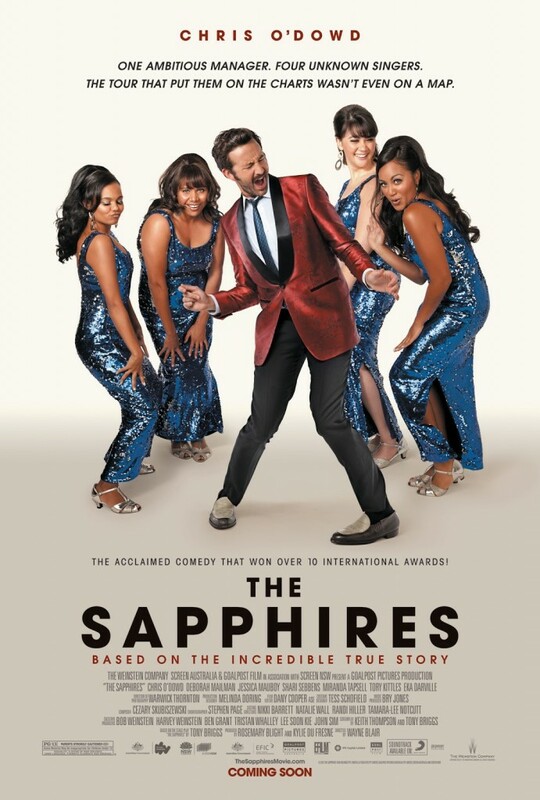 The Sapphires contains romance, laughter, and a fantastic soundtrack of 1960’s soulful music. The film deals with issues of race, belonging, and the universal language of music. Although I mentioned That Thing You Do to create a mental picture, this film doesn’t quite reach the same mark as that Tom Hanks classic. Ultimately, The Sapphires wants to soar at great heights, but instead settles for a low, but elegant glide across the screen… but regardless, this film does have a great soundtrack and is worth watching.